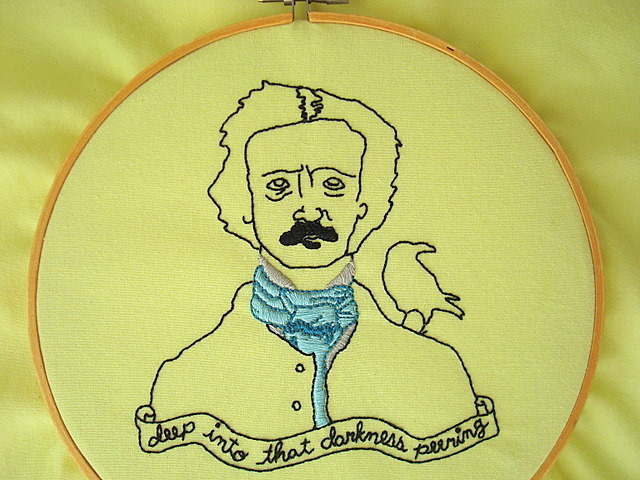 The Raven, one of Edgar Allan Poe's most parodied and quoted poems celebrates its 170th birthday today. It was published in the The Evening Mirror in 1845. However, I bet you have forgotten how ridiculously long it is, right? So long.... so very very long. Show of hands who just had a Gilmore Girls moment? If you think I am being ridiculous.... go ahead and read it. If you would rather skip to the end, you will find the real reason behind my post today - fan art!!! Yes, it has been a while since I shared my favorite fan art / fan inspired objects on a subject, but today I revive it in honor of Poe and his stalker, The Raven. Huzzah! You made it - whether you read through the poem or skipped ahead (I am not judging). Regardless of your journey, you now get to enjoy some of my favorite fanmade finds inspired by The Raven. Enjoy!